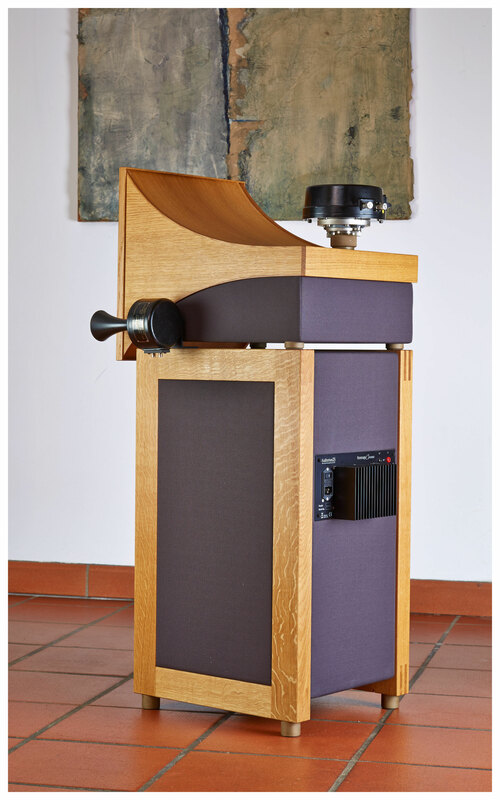 The loudspeaker Hommage Cinema is an overall installation using the LM 555 mid-range driver on a horn which was especially developed for this purpose and the LM 597 tweeter. Each bass cabinet contains two bass drivers of different diameters, differing crossover frequencies and adjustable volume. The amplifiers are executed with a A/B circuit. The complex field-coil supply unit (with selenium rectifier) with adjustablity as well as the amplifier units were exclusively manufactured for Auditorium 23. The partially active solution made it possible to power the complete speaker with the best low power eletronics without any negative interaction from the woofer system. The positioning of the tweeter can be handled in a flexible manner, e.g. with a mount as shown on the picture or with a freely positionable stand element. With the Hommage Cinema Auditorium 23 consistently pursued the aim to develop a speaker that over a wide spectrum reflects the outstanding qualities of the Hommage 22 A but which in its design and dimension shows an aesthetic that supports the integration into a wider range of living spaces. Because of the equivalent efficiency the speaker can as well effortlessly fill large rooms with sufficient sound energy. It´s difficult to verbally communicate the inner qualites and expressive richness of a system like the Hommage Cinema. To a large extend it defies itself from the well known and internalized HiFi definitions. 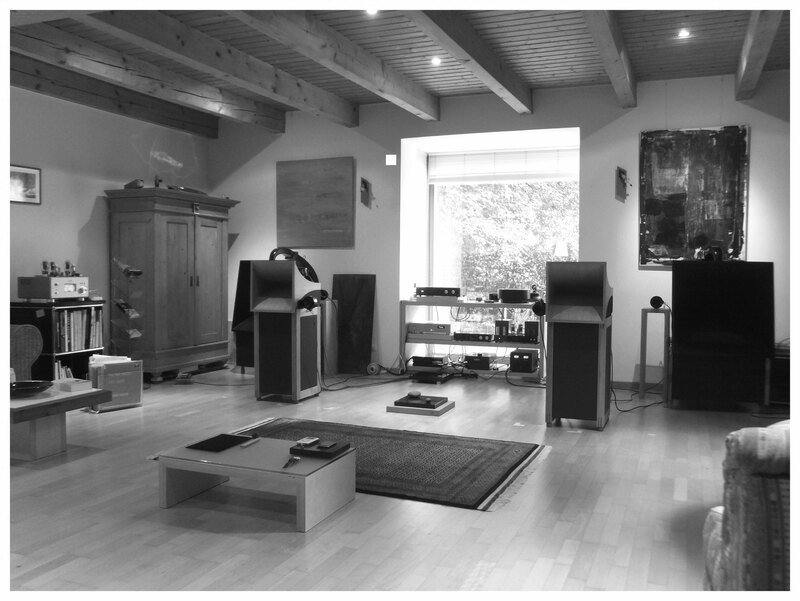 Because of the tremendously effortlessness way the speaker is able to reproduce sonic occurrences in a perfectly timed manner, music is transmitted into the room with magnificient ease and inner substance., allowing the listener to become deeply involved in the musical event. 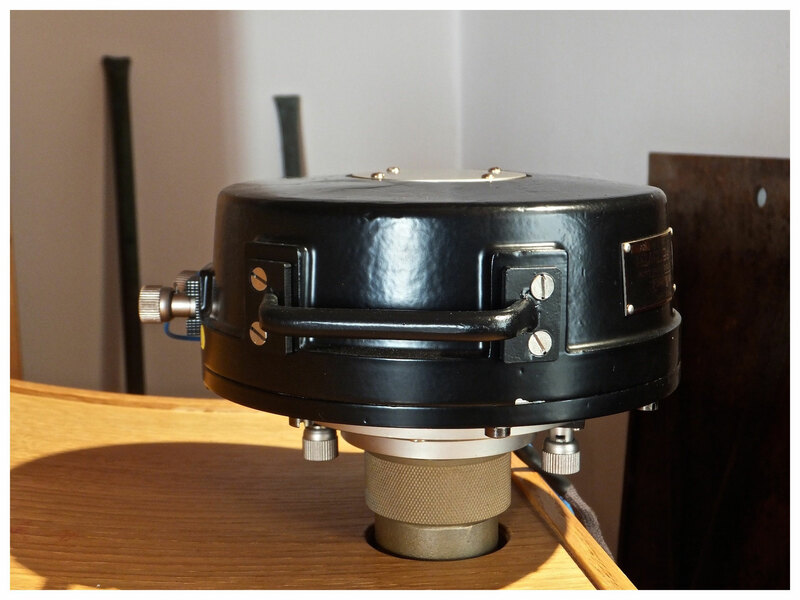 Mid-range horn is made of solid wood and laminated spruce plywood for LM 555 driver with cast-bronze adapter is app. 105db efficiency in combination with LM 597 tweeter. Not a shortened exponential-horn with a total length of app. 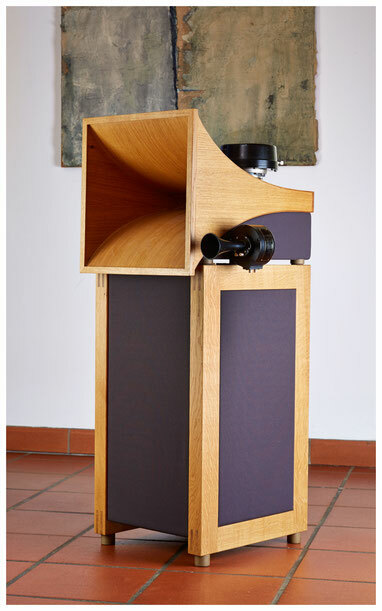 3,5 ft. Midrange-horn and tweeter use just a passive first order crossover. No linearization, no level adjustment, absorption circuit or low pass filter. Woofer: "Two-Way" Dipole with separate transformer-coupled A/B-amplifier for each driver. Just a first order low pass filter in front of each amp, passive, no electrical equalization or linearization. No internal absorbing materials. 12" und 7"-woofer. Separately adjustable upper and lower bass level. The overall system has an efficiency of 105db/1W/1m at 16 Ohm impedance. 3 watt of amplifier power is sufficient to run the installation. The applied electronics allows separate level adjustment and therefore adaptation on specific room conditions. All visible wooden parts are manufactured in manual work with solid wood or thick veneers or covered with high-quality textile.The speakers are available in walnut, cherry, ash or whitewashed (or not) oak.